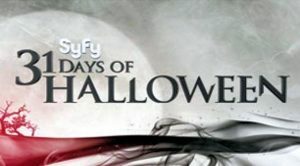 Syfy’s sixth annual 31 Days of Halloween will unleash nearly 600 hours of bloodcurdling programming throughout the entire month of October, led by Halloween-themed episodes of Ghost Hunters (October 30th) and Naked Vegas (October 29th), a Scare Tactics marathon (October 28th) and a trio of original horror movies including Zombie Night (October 26th) starring Darryl Hannah, Anthony Michael Hall and Shirley Jones. 31 Days of Halloween will include the Syfy premieres of Psychosis (October 5th) and Night of the Demons (October 10th), an evening of Nicholas Cage flicks – Drive Angry and Ghost Rider (October 27th) – as well as marathons of the series Being Human (October 18th), Friday the 13th: The Series (October 11th), Ghost Whisperer (October 10th) and Forever Knight (October 4th). Highlights of Syfy’s 31 Days of Halloween include…. A group of teens and their teacher are stranded in the countryside when they discover that the local legend of a murderous scarecrow creature is real – and the creature’s after them. Scarecrow stars Robin Dunne (Sanctuary) and Lacey Chabert (Family Guy). An American college student studying in Japan risks her own life to save the spirit of her dead mother who killed herself in the notorious real-life Suicide Forest. Grave Halloween stars Cassie Thomson (Big Love) and Graham Wardle (Supernatural). Set amidst the fast-paced glitter of life on the Las Vegas Strip, Syfy will transport viewers inside the provocative and imaginative world of body painting art in this new six-part docuseries. Just in time for Halloween, the first episode follows the Naked Vegas Team as they plan an over-the-top zombie-themed wedding at Eli Roth’s Goretorium at Planet Hollywood. Not only does the wedding couple want to stagger down the aisle in zombie body paint, but they want the entire wedding party painted to match the theme! Can the Team pull off this challenging make-up assignment – and convince the wedding party to go naked? To help put fans in the trick or treat mood, Ghost Hunters presents an especially spooky investigation the eve before All Hallows’ Eve. In the episode, titled “Hyde and Seek,” lead investigator Jason Hawes and the TAPS (The Atlantic Paranormal Society) team head to Cooperstown, New York, for their most anticipated investigation location of the season: Hyde Hall. They’re there to look into claims that the infamous mansion was cursed by its former owners during a family feud, and during the investigation, the team comes face-to-face with threatening paranormal activity. Throughout the episode, TAPS will also share personal Halloween messages with viewers at home.